Palestinian scholar of the last tannaitic generation (second and third centuries). Only two Haggadot (Mek., Beshallaḥ, introduction; idem to Ex. xiv. 7) and one Halakah(Yer. Hor. iii. 48a) have come down from him. In the first-mentioned passage he thus illustrates the verse (Ex. xiii. 21): "And the Lord went before them by day in a pillar of a cloud, to lead them by the way," etc., by a simile: "A king had held court till darkness set in, his sons all the while attending him. On leaving the tribunal, the king took up a torch and lighted the way for his sons; whereupon the courtiers said to him, 'We will take up the torch and carry the light before thy sons'; but the king replied, 'It is not because I have none to do it in my stead, but I wish to manifest my affection for my sons, that ye may honor them accordingly.' Thus did the Holy One, blessed be He, make known His love for the people of Israel that the world might learn to treat them with honor. But, alas! not only does the world not do so, but it decrees upon them one mode of death after the other, each one severer than the last." Mekilta in both instances gives "Antoninus" as the author, and so does Yalḳ., Ex. 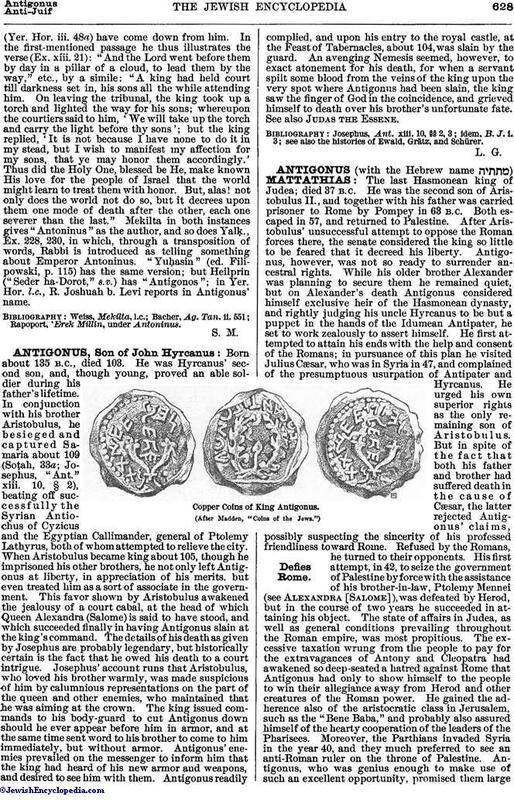 228, 230, in which, through a transposition of words, Rabbi is introduced as telling something about Emperor Antoninus. "Yuḥasin" (ed. Filipowski, p. 115) has the same version; but Heilprin ("Seder ha-Dorot," s.v.) has "Antigonos"; in Yer. Hor. 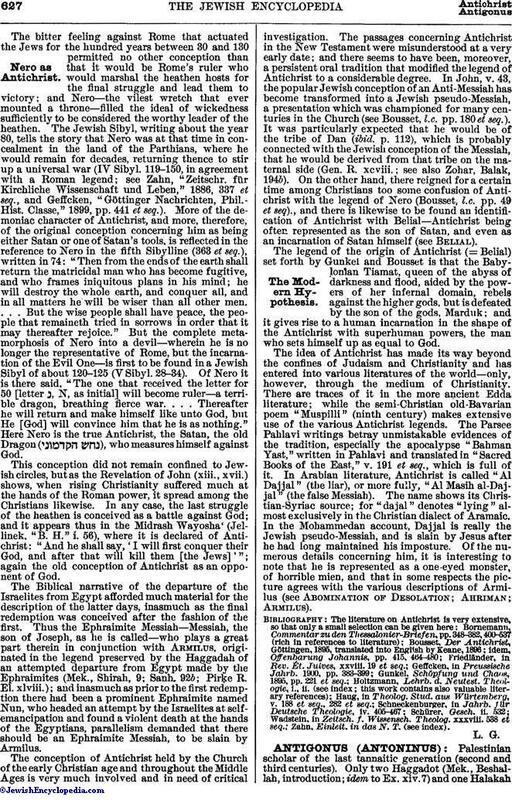 l.c., R. Joshuah b. Levi reports in Antigonus' name. Rapoport, 'Erek Millin, under Antoninus.